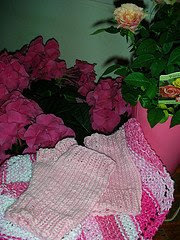 Simply Grace Designs: Dishcloth Mitts! 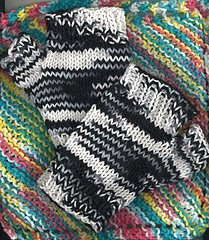 I really should call these mitts, Wheelchair Mitts instead of Dishcloth Mitts. 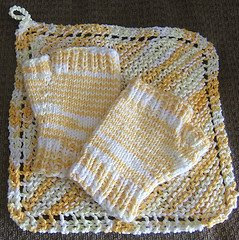 I called them Dishcloth mitts since the yarn I use is from Peaches and Creme cotton yarn. Usually we knit up dishcloths with this cotton yarn. 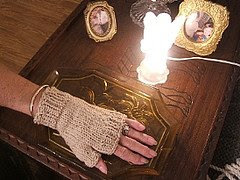 It is very soft though and makes nice fingerless gloves or mitts. My mother lives with me and is confined to a wheelchair. She is very meticulous and always was washing her hands since the wheels of the chair made her hands black (from the rubber of the wheels.) I first made her mitts out of wool and even cashmere. I couldn't wash them like I wanted to though and decided to try dishcloth yarn. The dishcloth yarn worked great. 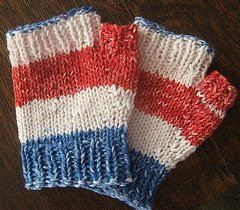 I can wash the mitts daily and they are only a dollar or two to make her a pair. I am trying to make her up as many as I can in all color-ways. 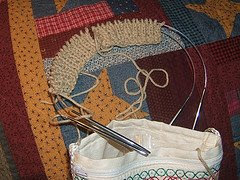 The variegated yarn or ombre works as nicely as the solid colors. 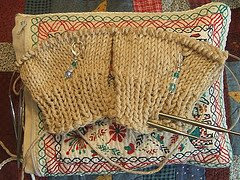 I have started to make two at a time with two circulars since it is faster that way. As with all my E-Patterns, email me if you would like a copy. If you are on Raverly, my ID is pamamom and you can download directly from Ravelry.